Capoeira Angola is an Afro-Brazilian martial art that combines acrobatics, fighting, music, African history and philosophy and refers to every capoeira style that keeps the traditions held before the creation of the Regional style. Enslaved Africans brought the movements of Capoeira Angola to Brazil, disguising the martial elements of Capoeira Angola as dance and adding music and singing. Since the abolition of slavery until present day, Capoeira Angola continued to develop as a community instrument of freedom and social resistance. In 1941, Mestre Pastinha who was much respected by recognized capoeira masters, opened the Centro Esportivo de Capoeira Angola (CECA). His preference for the playful aspects of the game, rather than the martial side, became associated with Angola style that was also characterized as being strategic, with slow, smooth, sneaking movements played low to the ground. 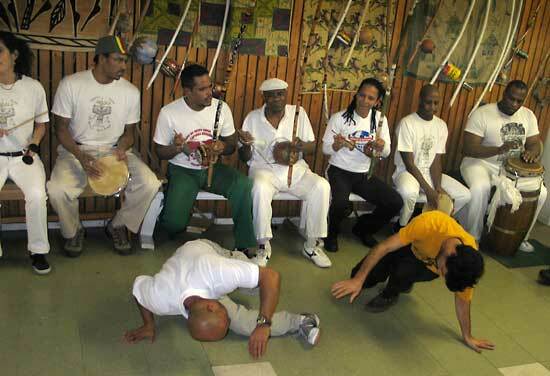 The music typically played with capoeira is in bateria (percussion band) formation in a roda of Capoeira Angola. Instruments played are three berimbaus (stringed percussion instrument), two pandeiros (tambourine-like instrument), one atabaque (tall drum), one agogô (cowbell-like instrument) and one ganzuá (bamboo stick instrument). Today, Capoeira Angola groups flourish across Brazil and around the world.